We have long been advocates of making ice cubes from coffee, tea, juice, wine and soda, so as not to dilute our iced coffee, iced tea, cocktails, punch and soft drinks (original article). You can add mint leaves to water to create mint ice cubes for Mojitos, basil leaves in water or tomato juice for Bloody Marys and berries in water for any sweet drink. Depending on the recipe, you can simply pop the cube into the pot. You can transfer the cubes to a freezer bag after they’re fully frozen, or keep them in a covered ice cube tray (if your tray doesn’t have a tight-fitting cover, use plastic wrap). When you’re ready to use them, remember that each cube is approximately one teaspoon; eight standard cubes comprises roughly one cup. 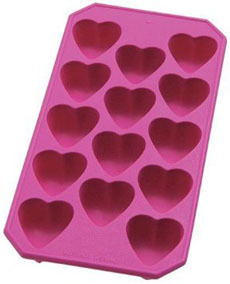 We often give seasonal ice cube trays as gifts, along with our list of things to use them for year-round. 1. CLEAN. Wash and pat dry. Decide if you want to freeze whole or chopped herbs, and chop as desired. 2. CHOP. The objective is to have the water cover the herbs, so fill the ice cube tray sections with a tablespoonful of chopped herbs or as many whole herbs as fit. Tamp down whole herbs. 3. FILL. Fill the tray halfway, using enough water to cover the herbs (though the herbs tend to float). Freeze. 4. FREEZE. Once the ice cubes are largely frozen, finish filling the tray with water and freeze completely. Remove from the tray and store in freezer bags. 5. USE. Toss frozen cubes directly into the pot or pan. The heat will defrost the cube. If you need to eliminate the water, add the cube first and let the water evaporate. Never again toss out unused, wilted herbs!